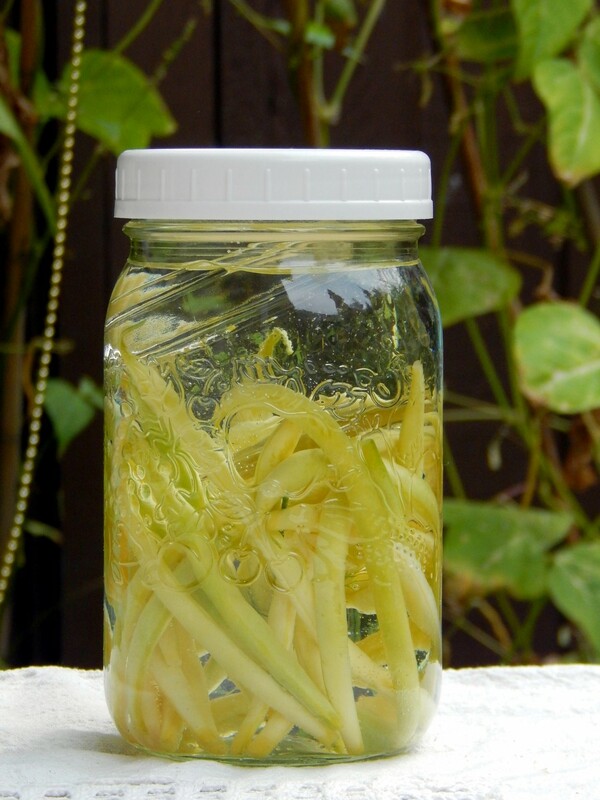 There are a number of topics that seem to constantly be debated in the fermenting world. They always pique my curiousity, but I seldom have the time to delve into a full exploration of them. (My two kids and work seem to fill up most of my free time!) However, these topics keep coming up, and I really want to know The Ultimate Fermenting Truth! I am, at heart, a scientist. I did my Master’s in Neuroscience and love all things biology-body related. I think it’s why I’ve gotten so into fermenting… because it truly is a science. So I’m going to turn my critical eye to a few fermenting topics, and hope to do justice to the science behind all of the fermenting folk-lore and legends. The world is far less than ideal. 1. Unfortunately, the majority of our vegetables are not grown in lovely fields filled with a complete ecology of diverse microorganisms. Even organic farms can no longer be assured of having a high quality soil, as mass food production takes over in a big way. 2. Unless you’re already an avid fermenter, there’s a good chance the “air” in your house isn’t full of good, happy bacteria. This is especially true if you have a hepe-filtered air system or use antibacterial cleaning supplies. 3. Sometimes, you many not want to use the ideal amount of salt. Perhaps you’re like my parents, and you’re required to make reduced salt ferments for health reasons? Perhaps you just don’t like your vegetables to be that salty? 1. NEVER use a starter with sauerkraut (curtido or kimchi). There’s a reason that cabbage is the most popular fermented vegetable, and that’s because it pretty reliably has the lactic bacteria that it needs on it’s skin. Mucking around with the system usually introduces things like yeast to the party and results in a failure. 2. 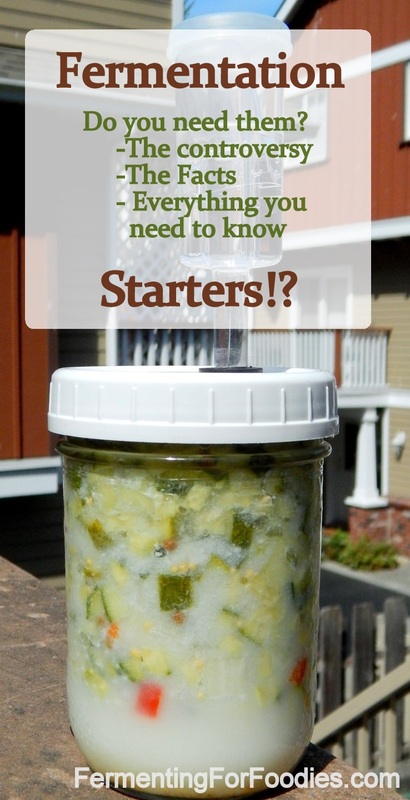 I usually use a starter for any quick vegetable ferments simply because I want to make sure that the ferment goes well and quickly. Sauerkraut and pickles both are longer ferments and should be left to the risks involved with developing their own culture. Ultimately, longer ferments involve a succession of different bacterial strains and you don’t want to mess around with that. 3. It’s always best to use a vegetable specific starter. This could be a purchased starter, or sauerkraut juice. Alternatively, most any culture that you have on hand will work (including a nice clear whey, homemade water kefir, or kombucha). 4. When using a starter, don’t expect the ferment to last as long outside of the fridge, since it alters the natural fermentation process. 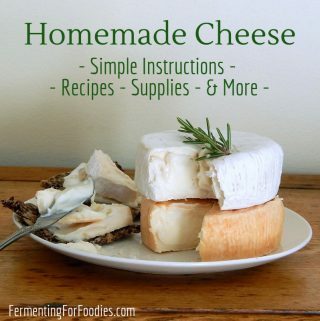 When using a starter, I usually ferment for 3-5 days before refrigerating. To a Fermenting Purist, using a starter introduces all sorts of undesirable yeasts and bacteria. 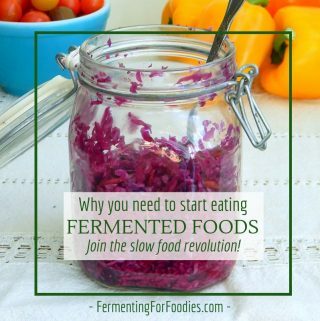 Even using a vegetable starter or sauerkraut juice is not ideal, because there is a natural rise and fall in the different types of lactic bacteria as the fermentation process goes on. 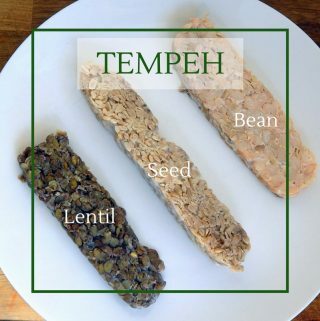 Any introduced bacteria are nothing like those naturally found in a vegetable ferment and should not be used for fermenting. This is both true and not true. 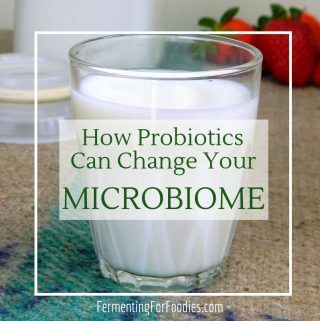 Certainly, the bacterial strains in whey are not the same bacterial strains in a vegetable ferment, however, they will still help my vegetables to ferment. And I will still get a good dose of probiotics whether I’ve fermented with a starter or simply used brine. Furthermore, I can use different starters to change the resulting flavour of my ferment, which leads to all sorts of different taste combinations!